Replacing a high school campus that was widely published when it opened 50 years ago and still known for its strong academic program had its challenges. The multi-building complex was beloved for its informal and open campus, but crumbling structures, failing systems, and spaces ill-suited to 21st century learning required a new vision. An intensive pre-design process with community stakeholders resulted in that vision and a user-focused design solution that accommodates equally well the best of both its classical teaching traditions and innovative new learning models. Two multi-story buildings are anchored by an open courtyard that functions as an all-weather student commons. It also acts as a link between the academic classroom building and the commons building, which houses administration, fine and performing arts and athletic spaces. The two new buildings, plus the renovated field house, replace a collection of eight buildings that were considerably less efficient and created isolated learning experiences. 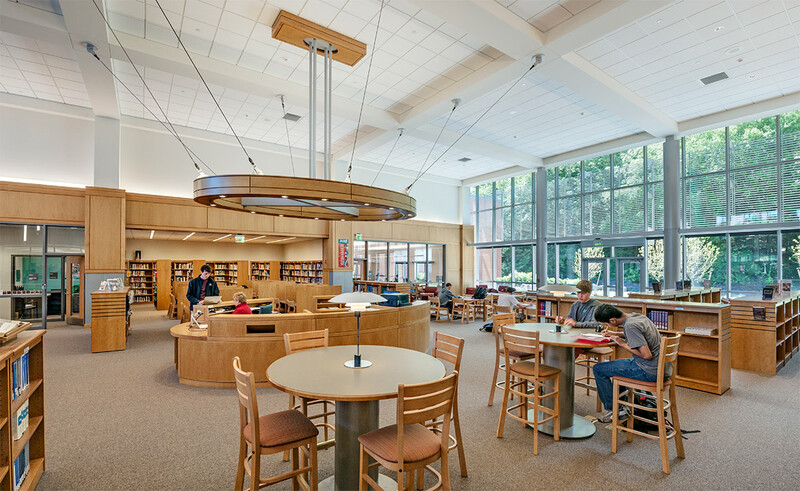 In addition to general classrooms, the new school has a variety of learning environments including a library/media resource center, a seminar room with tiered seating, a music suite, art studios, a fabrication shop, a fitness studio and a field house. The commons building includes a 600-seat auditorium, the student dining commons that also serves as a lobby/reception hall, scene shop, art and music studios and a fitness center. You were always very open to listening to our ideas…from those early discussions came an incredibly creative way to solve the project’s major challenges…your design concept was embraced by the community and from there on we were on the fast track to success.